聖經用特別的字眼來敘述挪亞的洪水，即希伯來文מכּול(mabbul)和希臘文κατακλυσμός (動詞 κατακλύζω)。 相比之下，用於描述普通局部性洪水的有希伯來文שׁטף(sheteph)、בחך(nahar) 、נ חל(nachal)、זךם(zaram)，及希臘文πλημμυρα(plēmmura). M. Kruger, “Genesis 6-9: Does ‘All’ Always Mean All?” J. Creation 10(2):214-218(1996).返回文章. D.G. Hagopian, The Genesis Debate (Mission Viejo, CA: Crux Press, 2001).返回文章. G.L. Archer Jr. Encylopedia of Bible Difficulties (Grand Rapids, MI: Zondervan, 1982), p. 82–84.返回文章. Anon., Creation 21(3):49 (June-August 1999).返回文章. J. Woodmorappe, Noah’s Ark: A Feasibility Study (EI Cajon, CA: Institute for Creation Research, 1996), p. xi.返回文章. From Robert Bradshaw’s in depth study, Genesis Creationism and the Early Church, chapter 6, robilbrad.demon.co.uk/Chapter6.htm, August 13, 2003.返回文章. J Sarfati, “Calvin Says: Genesis Means What It Says”, Creation 22(4)44–45 (September-November 2000); creation.com/calvin.返回文章. J. Calvin, Genesis, 1554 (Edinburgh, UK: Banner of Truth, 1984), p.272.返回文章. See the review of Numbers’s historically unreliable (perhaps due to this anticreationist bias) book the Creationist, by E. Andrews,Origins 8(20):21-23 (1995). Numbers was raised in SDA home but now regards himself as agnostic.返回文章. J.C. Whitcomb and H.M. Morris, The Genesis Flood (Grand Rapids, MI: Bakere Book House, 1961).返回文章. K. Ham, “Demolishing ‘Straw men, Creation 19(4):13-15 (1997).返回文章. See also K. Ham, C. Wieland, and T. Mortenson, “Are (Biblical) Creatoniests ‘Cornered’? - A Response to Dr J.P. Moreland: The Bible Talks of ‘The Four Corners of the Earth.’ Dies This Mean the Days of Cration Could be Non-literal, Too?” J. Creation 17(3):43–50 (2003); creation.com/moreland.返回文章. J.P. Smith, Mosaic Acount of Craetion and the Deluge illustrated by Science (London, 1873). J.P. Smith, On the Relation Between the Holy Scriptures and Some Parts of Geological Science (London, 1839).返回文章. J. Hutton, “Theory of the Earth”, a paper (with the same title as his 1975 book) communicated to the Royal Society of Edinburgh, and published in Transactions of the Royal Society of Edinburgh, 1785; cited with approval in A. Holmes, Principles of Physical Geology, 2nd edition (London: Thomas Nelson and Sons Ltd., 1965), p. 43–44.返回文章. S. Gould, Natural History (February 1975): p.16.返回文章. L. Pierce, “Niagara Falls and the Bible”, Creation 22(4):8-13 (Spetember-November 2000).返回文章. D. Palmer, “Old Father Time”, New Scientist 179(202):50, (July 5, 2003).返回文章. J. Woodmorappe, Studies in Flood Geology, second edition (El Cajon, CA: Institute for Creation Research, 1999).這本書在第147–175頁列舉科學上的理由，解釋為什麼人們不應該把這些年期當真。也感謝伍莫佩為本章提供的大量資料。返回文章. J. Woodmorappe, The Mythology of Modern Dating Methods (El Cajon, CA: Institute for Creation Research, 1999).這本書提到，不論放射性側年法的衛道士們如何宣稱，自相矛盾是常規，而不是例外，而且在明顯的“好結果”和“壞結果”之間並沒有可靠的方法加以區分。返回文章. J. Woodmorappe, Noah’s Ark: A Feasibility Study (Ei Cajon, CA: INstritute for Creation Researh, 1996), p. 46–47.返回文章. J. Woodmorappe, Studies in Flood Geology, second edition (El Cajon, CA: Institute for Creation Research, 1999), p. 87–94.返回文章. See also J. Morris, The Young Earth (Green Forest, AR: Master Books, 1994).返回文章. A.A. Snelling, “Amazing ‘Ark’ Expose”, Creation 14(4):26–28(1992); cration.com/arkfraud.返回文章. J. Woodmorappe, Noah’s Ark: A Feasibility Study (El Cajon, CA: Institute for Creation Research, 1996), p. xii.返回文章. D.A. Carson, Exegetical Fallacies, 2nd edition (Grand Rapids, MI: Baker Book House, 1996), p.60.返回文章. BDAG, oikoumenē, definition 2, listing the examples Acts 17:6 and Acts 24:5.返回文章. J.C. Whitcomb, The World That Perished (Grand Rapids, MI: Baker Book House, 1973), p. 48–64.返回文章. M. Maniguet, The Theological Method of Hugh Ross: An Analysis and Critique, M.Th. Thesis, Systematic Theology, Baptist Bible Seminary, Clarks Summit, PA (May 2002): p. 85–86.返回文章. H. Ross, The Flood, Reasons to Believe tape A8712, Part 1, 1990 (transcript avaliable from James Stambaugh, librarian at Michigan Theological Seminary).返回文章. M. Luther, Luther’s Works, Vol. I: Commentary on Genesis 1-5, J. Pelikan, editor (St Louis, MO: Concordia, 1958), p. 99.返回文章. Augustine, Augustine, The Literal Meaning of Genesis, 5.7.20, (Taylor, No.41, 158).返回文章. J.R. Hughes, “An Examination of the Assumptions of ‘Eden’s Geography Erodes Flood Geology,’” CRSQ 34(3):154–161 (1997).創世記前幾章裡的地理名詞都是“普通”名詞。再者，洪水前的地名也可能在洪水後被重新使用。事實上，聖經中別處也經常出現重名的情況。 返回文章. B. Nelson, The Deluge Story in Stone (Minneapolis, MN: Bethany Fellowship, 1931, 1968), p. 169. 返回文章. Roth, A.A., “Flat gaps” in ssedimentary rock layers challenge long geologic ages, J. Creation 23(2):76–81, 2009;’Milions of years’ is missing: interview with biiologist and geologist Ariel Roth, Creation 31(2):46–49, 2009.返回文章. D.L Baars, “Permian System of the colorade Plateau”, American Association of Petroloeum Geologists Bulletin 46(1962): p. 200-201.S. Austin, editor, Grand Canyon: Monument to Catastrophe (Santee, CA: ICR, 1994), p. 34–35.返回文章. S. Gould, Natural History (February 1975).返回文章. A. Snelling and S. Austin, “Grand Canyon: Startling Evidence for Noah’s Flood!” Creation 15(1):46–50 (December 1992).返回文章. J. Woodford, “Rock Doctor Catches Up with Our Prehistoric Surf”, Sydney Morning Herald (April 30, 1994): p. 2. For more detail, see P.J.返回文章. Conaghan, “The Hawkesbury Sandstone: Gross Characteristics and Depositional Enivironment”, Bulletin, Geological Survery of New South Wales 26:188–253, (1980).返回文章. T. Walker, “Three Sisters: Evidence for Noah’s Flood”, Creation 25(2):38–42 (March-May 2003). 返回文章. This section is based on CAB chapter 11; J. Baumgardner, “Catastrophic Plate Tectonics: The Physics Behind the Genesis Flood”, in R.L. Ivery Jr., editor, Fifth International Conference on Creationism, Creation Science Fellowship, Pittsburgh, Pennsylvania, (August 2003): p. 113–126; www.globalflood.org/papers/2003ICCcpt.html.返回文章. 並不是所有的創造論者都贊同災變板塊動力學，相關的論壇見J. Creation 16(1):57,2002；creation.com/cpt_forum.我認為它仍然是最有前景的理論，解釋了一些支持均變板塊動力學的資料，並解決了其中存在的許多問題。該理論也為快速磁極反轉提供了一個機制。它也為切削出大型洞穴的熱液指明了一個來源（Silverstru, E., Caves for all seasons, Creation 25(3):44–49, 2003）。但是災變板塊動力學不是聖經的直接教導，而在科學上容許多個模型共存是好事，尤其是對不可觀測之過去的理解。又見J. 返回文章. Sarfati, Flood models and biblical realism, J. Creation 24(3):46–53, 2010.返回文章. Baumgardner, J.R., Catastrophic Plate Tectronics: the physiscs behind the genesis flood, Fifth International Conference on Creationism, Creation Science Fellowship, Pittsburgh, Pennsylvania, August, 2003; globalflood.org/Beard, J,. How a supercontinent went to pieces, New Scientist 137:19, 16 January 1993.返回文章. Anon., Atlas of the Arab World and the Middle East (London: Macmillan and Co., 1960) p. 31, 39.返回文章. K. Ham, “Demolishing ‘Straw Men,’ “ Creation 19(4):13–15 (1997).返回文章. J. Sarfati, “Expose of NavPress’s New Hugh Ross Book: The Genesis Question”, J. Creation 13(2):22–30, (1999); creation.com/ross_GQ.返回文章. R.D. Jarrett and H.E. Malde, “Paleodischarge of the Late Pleistocene Bonneville Flood”, Geological Society of America Bulletin 99:134, (1987).返回文章. C.Wieland, “Darwin’s Real Message: Have You Missed It?” Creation 14(4):16–19 (September-November 1992); creation.com/realmessage.返回文章. V.R. Baker et al., “Columbia and Snake River Plains”, Geological Society of America Centennial Special 2:415 (1987). 返回文章. S. Austin, editior, Grand Canyon: Monument to Catastrophe (Santee, CA: ICR, 1994), p. 94–95.返回文章. V.R. Baker et al., “Columbia and Snake River Plains”, Geological Society of America Centennial Special 2:415 (1987): p.428.返回文章. 古爾德布萊茲有理由對任何人發怒。見S.J. Gould, “The Great Scablands Debate”, Natural History 87(7):12–18, (1978).返回文章. J.H. Bretz, “The Channeled Scablands of the clumbia Plateau”, Journal of Geology 31:617–649 (1923); “Glacial Drainage on the Columbia Plateau”. Geological Soc. Amer. Bull. 34:573–608 (1923). See also M. Oard, The Missoula Flood Controversy and the Genesis Flood, CRS Books, 2004.返回文章. S. Austin, editor, Grand Canyon: Monument to Catastrophe (Santee, CA: ICR, 1994), p. 46–47.返回文章. See C. Wieland, “Tackling the Big Freeze: An Interview with Creationism’s ‘Mr. Ice Age’—Weather Scientist Michael Oard”, Creation 19(1):42–43 (1994).返回文章. J. Hornell, “The Role of Birds in Early Navigation”, Antiquity 20(79):147 (1946).返回文章. H. Gatty, Nature Is Your Guide (Harmondsworth, UK: Penguin Books, 1958), p. 214.返回文章. V.R. Baker et al., “Columbia and Snake River Plains”, Geological Society of America Centennial Special 2:415 (1987): p. 425.返回文章. Atlas of the Arab World and the Middle East (London: MacMillan & Co., 1960) p. 31, 39.返回文章. V.R. Baker et. al., “Columbia and Snake River River Plains”, Geological Society of America Centennial Special 2:415 (1987):424.返回文章. E. Holroyd, “Cavitation Processes During Catastrophic Floods”, in R.E. Walsh and C.L. Brooks, editiors, Proceedings of the Second International Conference on Creationism (Pittsburgh, PA: Creation Science Fellowship, 1990), 2:101–113.返回文章. D. Allen, “Sediment Transport and the Genesis Flood”, J. Creation 10(3):361 (1996).返回文章. J.C. Whircomb and H.M. Morris, The Genesis Flood (Grand Rapids, MI: Baker Book House, 1961), p. 60–62.返回文章. H. Miller, The Testimony of The Rocks (New York: Robert Carver and Brothers, 1875), p. 358.返回文章. R.A. Morre, “The Impossible Voyage of Noah’s Ark”, Creation/Evolution XI:3–36, (1983).返回文章. See J. Woodmorappe, Noah’s Ark: A Feasibility Study (EI Cajon, CA: Institute for Creation Research, 1996).返回文章. L. Pierce, “The Large Ships of Antiquity”, Creation 22(3):46–4 (June–August 2000).返回文章. J. Woodmorappe, Noah’s Ark: A Feasibility Study (EI Cajon, CA: Institute for Creation Research, 1996), p. 50–51.返回文章. D. Batten, “Modeling the Size of Noah’s Ark”, Creation 21(1):12–14 (December 1998-February 1999).返回文章. S.W. Hong et al., “Safety Investigation of Noah’s Ark in a Seaway”, J. Creation 8(1):26–36(1994); creation.com/arksafety. All the co-authors are on the staff of the Korae Research Institute of Ships and Ocean Engineering in Daejeon.返回文章. T.B. Walker, “The Pitch for Noah’s Ark”, Creation 7(1):20 (1984).返回文章. “Naval Stores”, Encylopaedia Britannica 8:564–565, 15th ed. (1992); emphasis added.返回文章. Thomas Gold (1920—2004), The Deep Hot Biosphere (New York: Springer, 1999).返回文章. J. Woodmorappe, Noah’s Ark: A Feasibility Study (El Cajon, CA: Institute for Creation Research, 1996), p. 120–123.返回文章. A. Lamb, The Pizzly: a polar bear / grizzly bear hybrid explained by the Bible, creation.com/pizzly, 16 May 2006.返回文章. P. Weaton and C. Wieland, “Bears Across the World”, Creation 20(4):28–31 (November 1998); creation.com/bears.返回文章. L.S. Lerner, Good Science, Bad Science: Teaching Evolution in the States, Thomas B. Fordham Foundation (September 26, 2000).返回文章. J. Woodmorappe, Noah’s Ark: A Feasibility Study (El Cajon, CA: Institute for Creation Research, 1996), p. 3–5.返回文章. 在《日的意義》（A Matter of Days）一書中，羅思修犯了更多的錯誤，見Sarfati, Trilobites on the Ark? 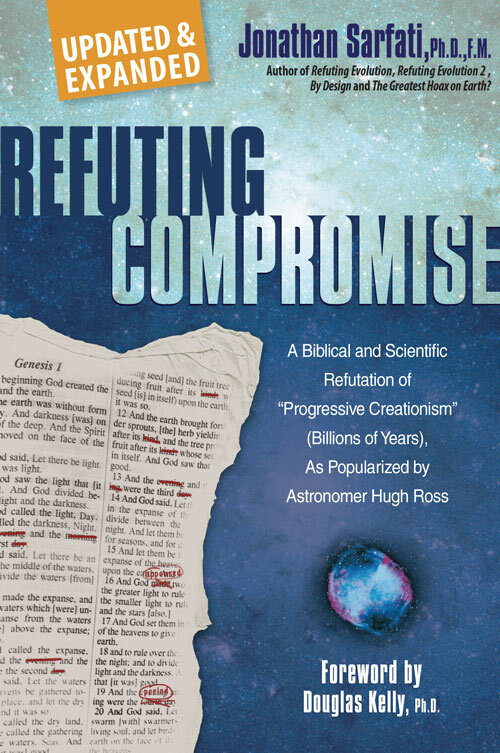 Hugh Ross’s latest bungles on the created kinds, creation.com/trilobites-on-the-ark, 30 July 2004 返回文章. Cited in J. Weiner, The Beak of the Finch: Evolution in Real Time (London House, 1994) p. 136.返回文章. J. Woodmorappe, Noah’s ark: A Feasibility Study (El Cajon, CA: Institute for Creation Research, 1996), p. 71–81.返回文章. R.A. Moore, “The Impossible Voyage of Noah’s Ark”, Creation/Evolution XI:3–36, (1983).返回文章. L. Rodin et al., “Productivity of the World’s Main Ecosystems”, in Productivity of World Ecosystems (Seattle, WA: National Academy of Sciences, 1975), p. 19–21.返回文章. J.C. Whitcomb and H.M. Morris, The Genesis Glood (Grand Rapids, MI: Baker Book House, 1961). p. 104–106.返回文章. J. Woodmorappe, Noah’s Ark: A Feasibility Study (EI Cajon, CA: Institute for Craetion Research, 1996), p. 161–162.返回文章. J. Woodmorappe, “Hypercanes as a Cause of the 40-day Global Flood Rainfall”, in R.E. Walsh, eiditor, Proceedings of the Fourth International Conference on Creationism (Pittsburgh, PA: International Conference on Creationism, 1998), p. 645–658.返回文章. D.M. Raup, “Species Diversity in the Phanerozoic”, Paleobiology 2:279–288 (1976).返回文章. K. Padian and W.A Clemens, “Terrestrial Vettebrate Diversity”, in J.W. Valentine, editor, Phanerozoic Diversity Patterns (Princeton, NJ: Princeton University Press, 1985), p. 43.返回文章. Ibid., p. 146, P.W. Signor, “Real and Apparent Trends in Species Richness through Time”.返回文章. E. Sohn, “The Fossil Files”, New Scientist 179(2409):32–35 (2003).返回文章. P.R. Ehrlich and A.H. Ehrlich, Extinction (New York: Ballantine, 1981), p. 26.返回文章. R.M. May “How Many Species Are There on Earth?” Science 241:1441 (1988).返回文章. E.G. Leigh Introduction: “Why Are There So Many Kinds of Tropical Tress?” in The Ecology of a Tropical Forest, Leigh et al., editors (Washington, DC: Smithsonian Institution, 1982), p.63.返回文章. J.S. McIntosh, “Sauropoda”, in D.B. Wieshampel et al., The Dinosauria (Berkeley, CA: Universiry of California Press, 1992), p. 345.返回文章. G.M. Erickson et al., “Dinosaurian Growth Patterns and Rapid Avian Growth Rates”, Nature 412(6845):429–433, Fig. 2(July 26, 2001).返回文章. D. Burnie, “Animal”, Microsoft(R) Encarta Online Encylopedia 2002.返回文章. J.W. Orr, “Fish”, Microsoft(R) Encarta Online Encylopedia 2002.返回文章. D. Burnie, “Verrebrace”, Microsoft(R) Encarta Online Encylopedia 2002.返回文章. M. Oard, Ancient Ice Ages or Submarine Landslides? (Chino Valley, AR: Creation Research Soc., 1997).返回文章. Oard explians this in his technical book, An Ice Age Caused by the Genesis FLood (El Cajon, 1990). He also co-authored with Beverly Oard, Life in the Great Ice Age (Green Forest, AR: Master Books, 1993), which combines a colorful children’s novel with a simplified scientific explianation. See also D. Batten, editor, The Creation Answers Book, Creation Book Publishers, creationbookpublishers.com, 2009, chapter 16.返回文章. M. Oard, “An Ice Age within the Biblical Timeframe”, in R.E. Walsh et al., editors, Proceedings of the First International Conference on Craetionism II:157–163 (1986); creation.com/iceage.返回文章. C. Wieland, “The Lost Squadron: Deeply Buried Missing Planes Chanllenge ‘Slow and Graduat’ Preconceptions”, Creation 19(2)10–14 (June-August 1997); creation.com/squadron.返回文章.